This Garden Is Crying Out For An Outdoor Fireplace! 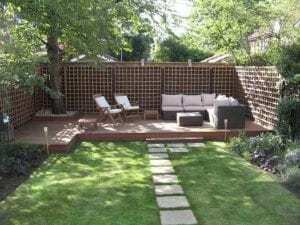 We all want to get more use out of our gardens but unfortunately the British climate is not exactly ideal for sitting outside into the wee small hours! Cooking and eating outdoors is one of lifes greatest pleasures for most of us. Invest in an outdoor fireplace and make the most of the garden. Just imagine being able to sit around with your friends, glass of wine in hand enjoying the warmth and glow of fire! 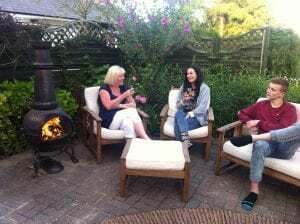 To recreate those warm evenings you get when you go abroad on holiday you could invest in a fireplace in your garden. From traditional to modern there are many great ideas out there! Draws family and friends together. The ambiance a fire creates, the smell and the sounds as well as warmth! Create some me time and curl up with a book. A Chimnea is an easy way to add a fire to the garden. Stove, Chimnea, Firepit, fire bowl in a table or full blown fireplace? Maintanance, the ashes will need to be emptied. Location, use on wooden decks can be dangerous or next to flamable materials. Also consider wind direction and what you will burn. You don’t want to produce too much smoke, consider fuel types, gas, bio fuels or wood. Functionality – do you want it to also serve as somewhere to BBQ or have a pizza oven. Safety, you must ensure the fire is stable and can not be knocked over. 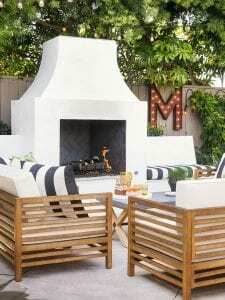 Now you could go all out and build an actual outdoor fireplace like this if your DIY skills are up to it and you have the room. We love this DIY Fireplace! Have you built an outdoor fireplace? We would love to see your pictures!